I've said it once and I'll say it again: onions are the foundation of so many recipes; Nearly every classic, savory recipe out there. Onions are the aromatic start to a great finish. That is definitely true for Southern Chicken And Dumplings. 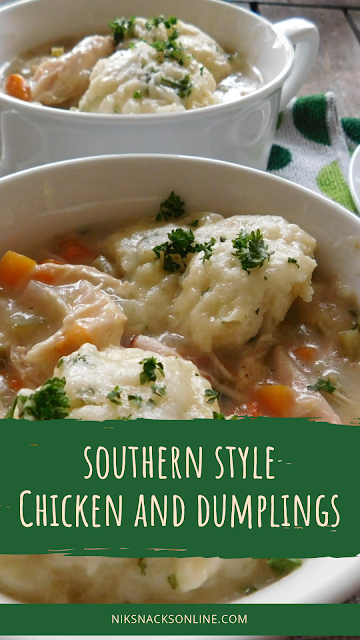 Chicken and dumplings is a classic dish that is easy to make (and easy to mess up). It starts with a deep, rich broth where bits of chicken are added and flour-based dumplings are added slowly on top of the bubbling soup and it all comes together in a symphony of deep, rich flavors. So there's two kinds of dumplings you'll find in a soup-based recipe like this: the fats and the flats. If you're interested in the rolled, flat dumplings, stop right here and visit my friend Jenni Field's blog and check out her perfect recipe. The fat dumplings are essentially pieces of biscuit that have been dropped out like a drop biscuit. Some are misshapen, some are big, some are small, but all of them have one goal: to be fluffy on the inside and doughy on the outside, thus creating a perfect contrast of texture to soak up some of the broth you've created with your aromatic vegetables and herbs. The flat dumplings are the popular girls. They're the ones everyone wants to be. Carefully rolled out and dusted with flour. Carefully cut into strips and laid out perfectly into the bubbling broth. The outsides and the insides of these strips meld perfectly into the soup. They do have a fatal flaw: sometimes they disappear do to the roiling of the broth, making the broth thick and creamy, like a gravy. This isn't necessarily a bad thing, it's just that when that happens, the dumpling doesn't get to be the star. I took an informal poll on Facebook, asking people which dumpling type they preferred and the fat dumplings barely eaked out past the flat or slick dumplings (30-28). Neither style is wrong, but if you want long, flat dumplings, just get yourself some chicken noodle soup. That's what you really want. 1. Season chicken on all sides with kosher salt and pepper. Heat oil or butter in a large Dutch oven over medium-high heat. Working in batches if needed, sear chicken, skin-side down, until deeply golden brown, 8 to 10 minutes. Flip chicken and continue to cook until it is browned on the other side, another 5 to 8 minutes. 2. Transfer chicken to a large plate or bowl, and pour off all fat into a cup. Debone the chicken, discarding the bones and skin. Shred chicken pieces with two forks or by hand. 3. Add butter to the Dutch oven and let it heat up. Saute the carrots, celery, and onions until soft (about 3 minutes). 4. Add chicken broth (4 cups) and bring to a boil. 5. Turn the heat down to simmer and add the chicken. 6. Meanwhile, to make the dumplings, mix together the 1 cup of flour, 1 teaspoon salt, 1 teaspoon baking powder, and 1 teaspoon fresh parsley. Stir in the remaining 2 tablespoons of butter, melted, until flour mixture is crumbly looking. Add the remaining 1/2 cup of milk and stir until just combined. 8. Divide among serving bowls; Serve garnished with extra fresh parsley, salt and fresh ground pepper, if desired.